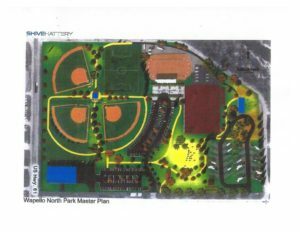 This is the design plan for the Wapello North Park renovation, courtesy of Wapello Hometown Pride. Some towns in Iowa may be seen as just “bedroom communities”, from which people leave to travel for work, entertainment, and so on. Maine says the Wapello Hometown Pride organization has taken the mission to make these plans a reality. Maine says the multimillion dollar scale of this project for a town the size of Wapello may almost be insurmountable, but the Riverboat Foundation grant is just the first piece of the puzzle as they search for different ways of funding the park.